Irish immigrant Michael Donohue came to the U.S. alone, at the age of 8, and apprenticed as a bookbinder in Chicago. In 1861 he helped establish the printing and binding firm of Cox & Donohue. In 1871 the great Chicago fire wiped out the firm’s plant. Soon after, Donohue helped establish Donohue, Wilson & Henneberry. The name changed, around 1880, to Donohue & Henneberry. The firm began selling educational materials, as well as publishing, in this era. Around 1900 Michael Donohue and William Henneberry split the firm. Henneberry published in Chicago until he was bought out in 1919 by publisher John Cunio. That firm continued as Cunio-Henneberry Co. until at least the 1970s. Donohue established M. A. Donohue & Co. at the same Dearborn St. address in Chicago used by Donohue & Henneberry. Books appeared with both the Donohue & Henneberry as well as Donohue & Co. imprints from the late 1890s and early 1900s. Donohue & Co was in business until around 1970 (the firm appears in business directories until 1970, their building on Dearborn St. was up for lease in 1973). (source). 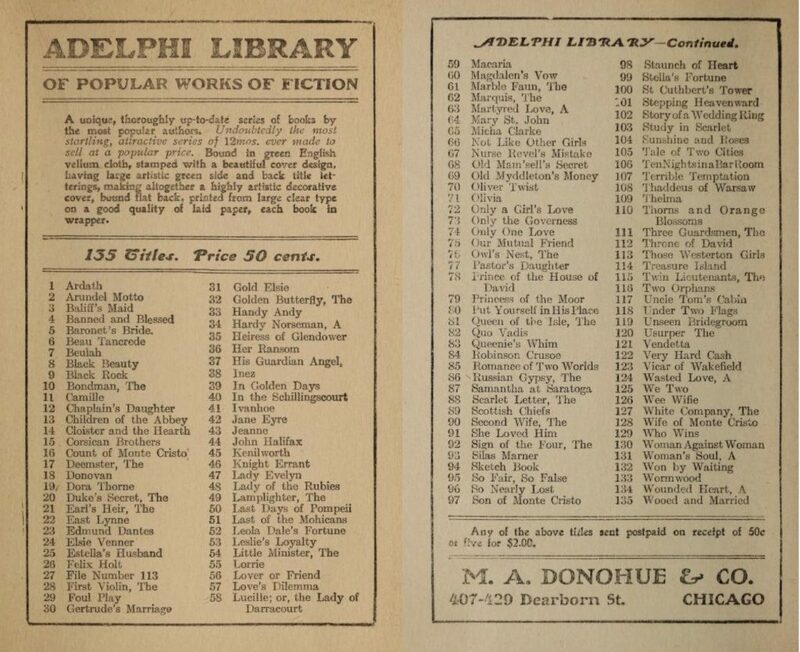 Early Donohue & Co. book series, such as the Adelphi Library, are difficult to track down by name in contemporary sources. I suspect the series were not advertised much but instead sold in bulk for sales through department, drug and dime stores. 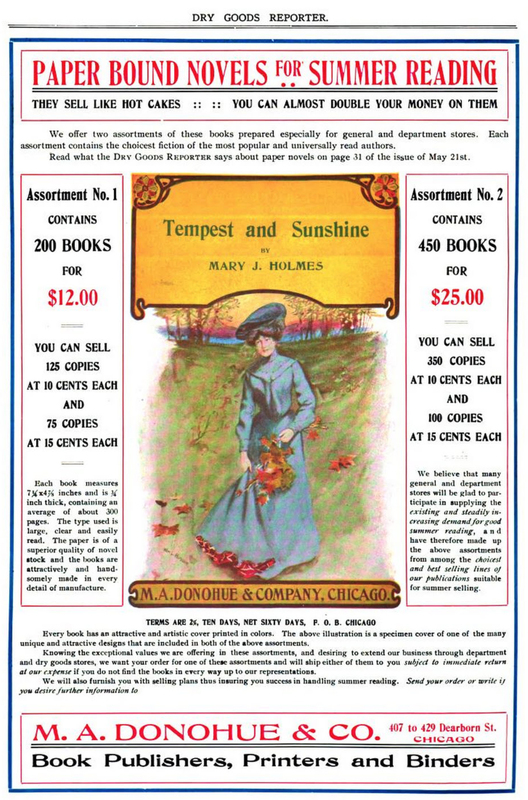 An advertisement, below, from the Dry Goods Reporter, May 28, 1904, advertises Donohue & Co. paperbound novels, sold in bulk with an only minimal indication of the actual titles that would be shipped. 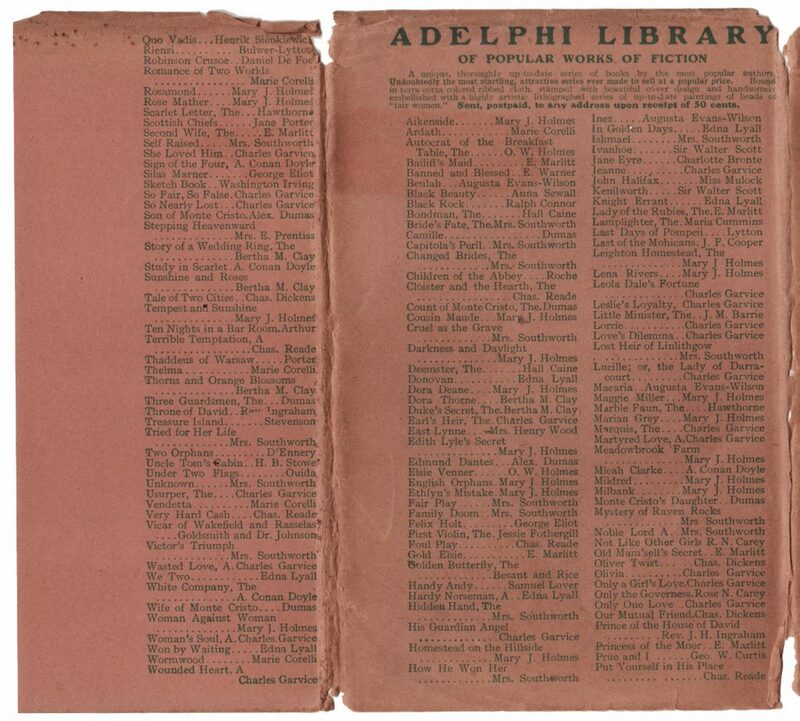 The Adelphi Library is similar to and contains many of the same titles as Donohue’s Adelaide Series: cheap, popular fiction in decorative bindings with mediocre paper and printing. The price is .50 cents from the publisher, which includes shipping. There is no store price, but probably .35 cents like the Adelaide Series. Mary J. Holmes sold more than two million books in her writing career, which included 39 novels. She wrote largely about domestic life, women, class, and race and while largely ignored by 20th-century literary scholars, has received some recent attention. 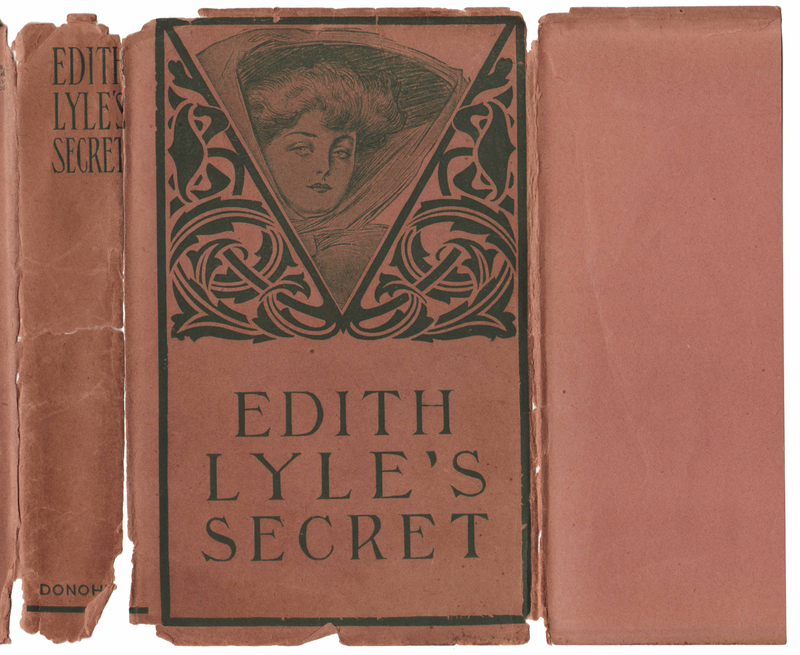 Edith Lyle’s Secret was first published as Edith Lyle by G.W. Carleton and Co. of New York in 1876. It was reproduced by many publishers in the last decade of the 1800s and first decade of the 20th century, one of the numerous Victorian-era novels that went out of copyright or were just pirated and sold as inexpensive paper or hardbound books. 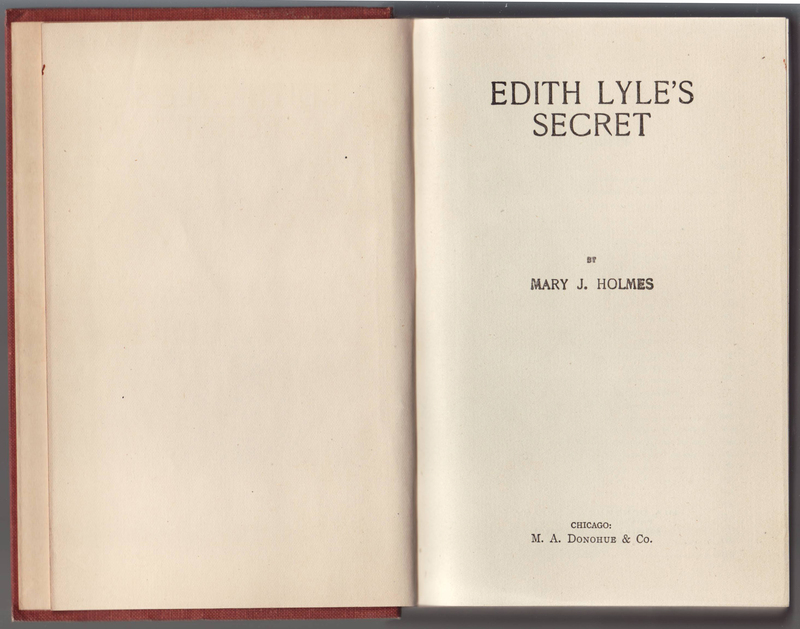 This copy of Edith Lyle’s Secret is undated, but the address for Donohue & Co. in the book (407, 429 Dearborn) places it in the 1901-1906 time frame. A copyright book, My Lady Cinderella by Mrs. C.N. Williamson, first published in 1906, is advertised in the back of the book. 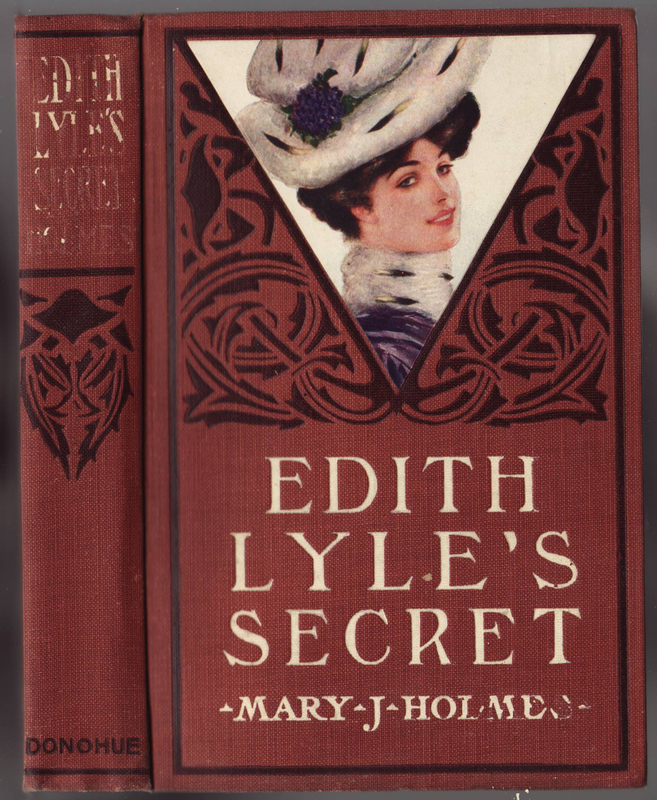 Burt issued Edith Lyle’s Secret in their Home Library in 1904, and it is likely Donohue issued their Adelphi Library version a year or two later. Thus 1905-06 is an educated date for this particular book and the series was probably first available about that time. Jackets share a common design but do have a unique illustration of a typical turn-of-the-century heroine on the front of the jacket. Some of the arts-and-crafts inspired decorations on the book are mimicked on the jacket. The author’s name is left off the jacket (both spine and front), but is on the book spine and front. The front jacket flap is blank. The rear of the jacket indicates the series name (which is not on or in the book itself) and the back of the jacket and rear jacket flap lists the titles in the series. There is significant overlap with the titles in the Adelaide Series. The titles are arranged alphabetically by the titles. 141 titles are listed. An advertisement (below) taken from The Baronet’s Bride, by May Agnes Fleming, (Chicago: M.A. Donohue) is also from the 1901-1906 era. The list of titles is numbered to 135, six titles fewer than the list above. Edith Lyle’s Secret is one of the titles not on this list. The Baronet’s Bride is on the list below but is not on the list above. Advertisement from The Baronet’s Bride, by May Agnes Fleming, Chicago: M.A. Donohue. 1901-1906 era. Bindings are brick-red cloth with printed typography and arts & crafts decorations. A color image, printed and glued to the front of the book, is reminiscent but not the same as the monochrome image on the jacket. Unlike the jacket, the author’s name is printed on the book spine and front. The copyright page includes the 407-429 Dearborn address in Chicago. 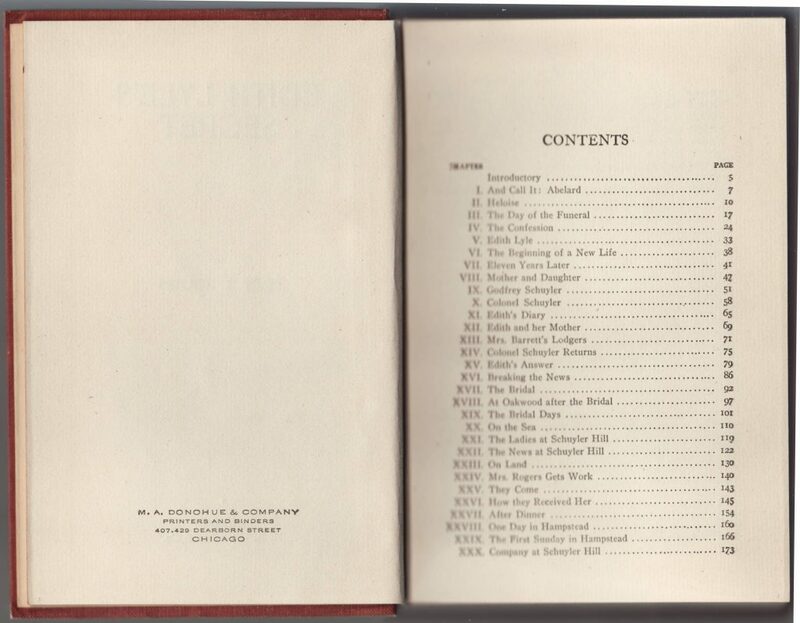 The table of contents follows. 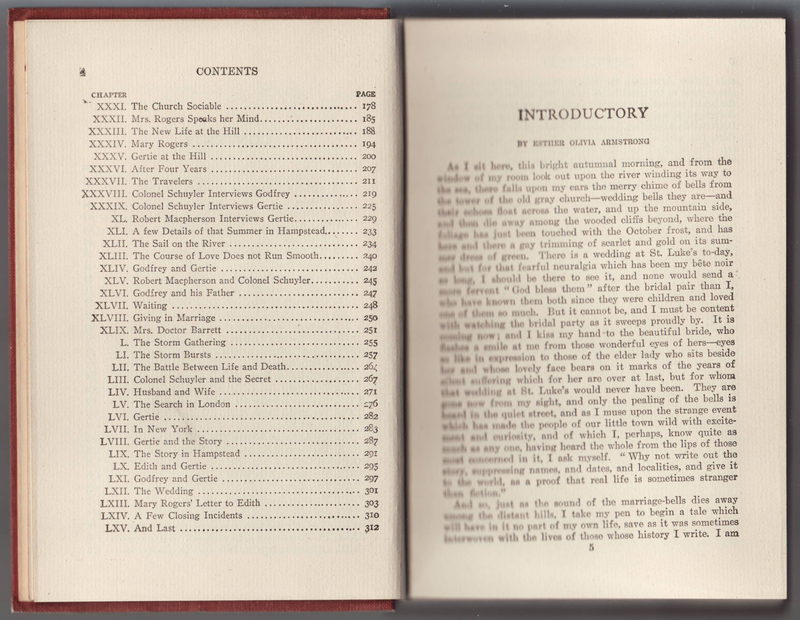 The rest of the table of contents and the first page of text. 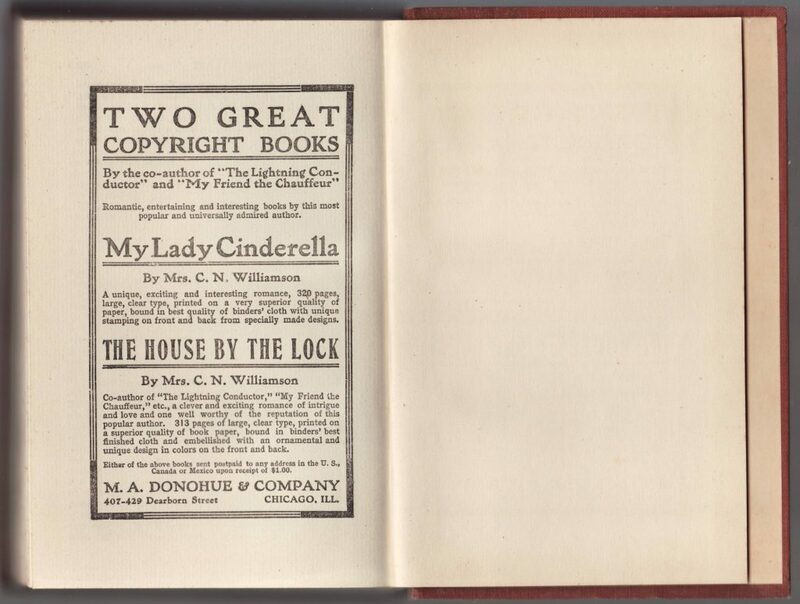 One page of advertisements is included in the back of the book, for two copyright titles by Mrs. C.N. Williamson.